Home / France / Live Blog #22Mai Day of the barricades – Against #Parcoursup – For a wild May! Live Blog #22Mai Day of the barricades – Against #Parcoursup – For a wild May! Welcome to our live blog. In the early morning hours students started to block universities and colleges. Public services are on strike. Cops were also active against la ZAD this morning. Be aware that we do what we can but there are strikes and protests across the french territory. We will not be able to cover them all. If you want to contribute to our live blog; You can send your pictures, videos, reports and analysis. Go to our submit page: here. Click at the refresh button of your browser to get the latest information. 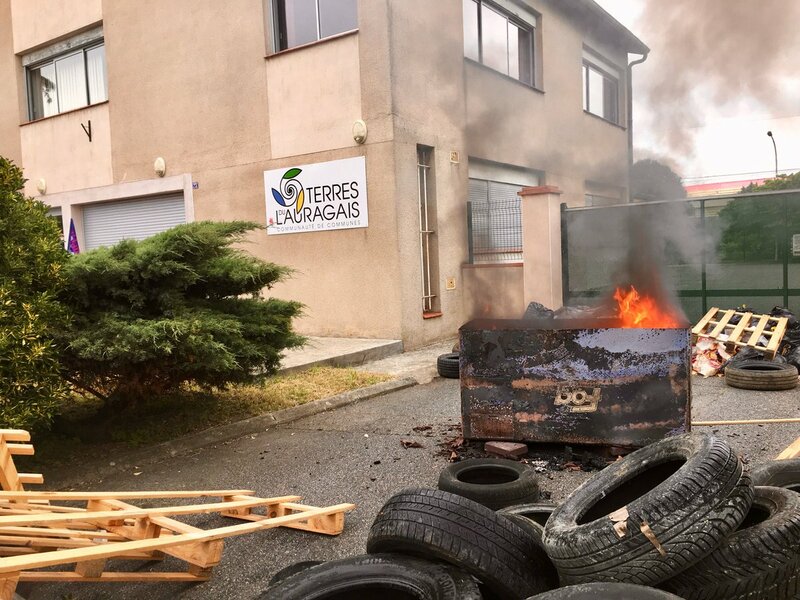 Image above: Barricade made by striking workers in Haute Garonne. Read the call for todays Day of the barricades: here. We also translated a German version of the call: here. 09:33pm We will go out now. Them next major mobilization in Paris will be at May 26 but in the coming hours and days there will also be strikes and actions. Thanks for reading. 09:24pm Paris: The cops detained 96 people during the eviction of Lycée Arago tonight. At 09:30pm there will be a solidarity gathering at 30 rue de l’évangile, Métro (subway) Marcadet Poissonniers. 08:00pm ZAD: The cops seem to have left the are around Domaine. 07:46pm At least 60 police vans in the Quartier Latin district in Paris. 07:46pm The medical team report that the clashes at La ZAD are ongoing. 4 seriously injured. One man lost his hand. The medic points are at Wardine, Bellevue and la Rolandière. 06:41pm Paris: The cops want to evict the lycée Arago. People are asking for support. 06:40pm Growing anger on the French territory. The government announced that they would release the parcoursup selections for universities at 06:00pm but the website is down. 05:55pm Paris: About 10 minutes ago cops detained 2 people at the boulevard diderot rue pic pus crossings. Cops also attack with tear gas. 05:45pm In 15 minutes students will start the next round of protests at Panthéon in Paris. 05:30pm Video in the tweet below is from confrontations in Paris about 1 hour ago. 05:15pm According to the cops until now 17 people detained in Paris. 05:11pm Clashes in Paris. Several detentions. 05:10pm We are back now and will resume our live coverage. 02:43pm Unfortunally we have to take a break now. We will be back at around 05:15pm. We have a meeting to prepare our trip to bosnia (More on that at: https://enoughisenough14.org/2018/05/21/the-balkan-route-took-a-new-turn-next-stop-bosnia/ ). 02:38pm La ZAD: New information about the seriously injured man we reported earlier about. According to several French main stream media reports (one of them in the Tweet below) his hand was not broken but teared of his arm. 02:29pm Paris: Plain clothes cops inside the Bastille subway (Metro) station. 02:22pm Striking railway workers on their way to the starting point of the demo at Place de Republique in Paris. 02:06pm Demo in #Paris started at Place de Republique. 01:53pm Image of the front of the demo in Rennes (from a bit earlier). 01:15pm La ZAD: Around noon one person was seriously injured with a broken hand because of a grenade thrown by cops. This person was evacuated with an ambulance after the cops took him away. This happened at La Chateigne. There are also tweets about many tear gas attacks. 01:09pm According to the tweet below the protesting cops were thrown out of the demo in Rennes. 01:00pm Students and activists are still at the front of the demo in Rennes. Cops try to prevent them from marching into the historic part of the city. 12:36pm Thousands took the streets in Lyon. 12:30pm Many people at the Gare du Nord in Paris. Especially many railway workers and students. En direct de l’AG intergares de la Gare du Nord (Paris). De nombreux Cheminots de province ont fait le déplacement, les Étudiants sont présents. 12:30pm In Dijon people will take the streets at 02:30pm (14:30). 12:01pm La Zad NDDL, Radio Klaxon: A severly injured person. request for urgent medical support between Bellevue and the Chateigne. People need food at Domaine. Other intervention with two people injured, need a vehicle to evacuate. About 100 cops are west of Rohanne (by foot). 12:00pm Demo in Rennes now marching towards des quais. 12:00pm The demo in Rennes seems to be marching again. We don’t know if the cops in the demo left or not. 11:43am Students are now in the middle of the demo in Rennes, blocking the rest of the demo. They demand that protesting cops leave the demo. 11:32am A group of students and other activists have just taken over the front of the demo in Rennes. 10:35am Earlier today striking workers disrupted traffic on the hihgway around Lyon. 10:20am Police violence against students at Saint Charles in Paris. Image by @JassieKiddo. #ZAD #NDDL: Reoccupation and Reconstruction – THEY ARE CUTTING US DOWN, WE GROW BACK – Enough is Enough!